When our coalition partners unite around a common agenda, change happens. 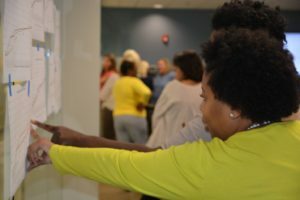 We look beyond individual programs and short-term fixes to the big, strategic changes that move all of us toward a stronger Central Alabama region. We choose projects where we can measure our results and ultimately see community-level improvements in health, education and financial stability that are aligned with the following goals. Education: Central Alabama will have 90% of high school seniors college and career-ready, and 125,000 highly skilled adults added to the workforce, by 2025. Learn more. Health: By 2025, all Central Alabama counties will be ranked in the top 10 in Alabama for health outcomes as measured by the Robert Wood Johnson Foundation. Learn more. Financial Stability: By 2025, serve at least 2,500 Central Alabama households through the Financial Services Network. Learn more. Click on the links below for information on our projects in Education, Financial Services and Health. Learn more about what we’re doing and how you can help!